Open ZIP and RAR archives, extract files"
When it comes to transferring a large number of files or data with huge storage size, the preferred format of choice is ZIP or RAR. These formats are file compression formats that make it possible to reduce files to 50% or 90% of their original size, thereby, spending less time and money in transferring files to other people while still preserving the original quality of the files. You can search for files within archives, export their contents to Microsoft Office, open multiple archives and create backups. In addition, there is a built-in file viewer. Some of the formats supported include 001, 7Z, CAB, CHM, RAR, and ZIP. The “Add” and “Extract” buttons will enable you to add compressed folders to the list and extract them respectively. Creating a new archive is as simple as clicking the “New” button. This is a software application that enables you to create, open and preview various compressed files – more than 40 different compression formats. In order to ensure all levels of users are catered for, the application provides four different user interfaces – Wizard interface, Classic interface, Processing interface. Here you have a full-featured archive manager, offering you more features than many other archive managers. It is part from compression category and is licensed as shareware for Windows 32-bit and 64-bit platform and can be used as a free trial until the trial period will end. 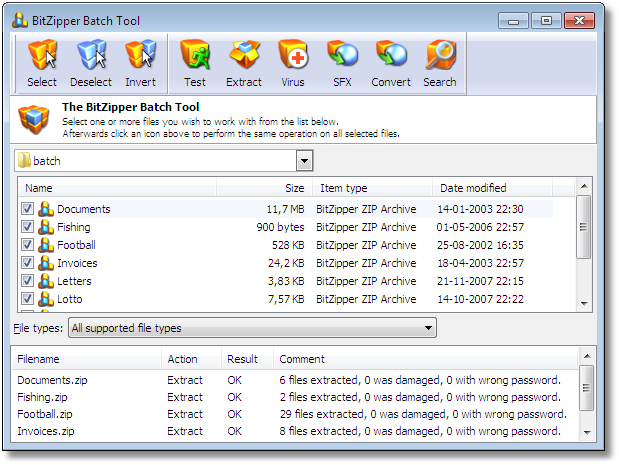 The BitZipper demo is available to all software users as a free download with potential restrictions compared with the full version.